Numbers 7 and 8 of the new quatrains as seen by John Le Saint, psychically guided into the future by the Soul of Nostradamus. There are nearly 1,000 written now. These new quatrains are the result of five years psychic visions, each night shown to me by Michel Nostradamus. Please read my Blog from the first post to understand the reasons that these new quatrains are being disclosed to the world. Endless numbers, Satan's Nimble fingers. Ledgers lost while hope no longer lingers. A Finger of God draws an arrow. A day of Celebration turns to sorrow. Nostradamus Psychic Predictions of the 2008 Presidential Elections John McCain Click Here for SHOCKING Psychic Nostradamus Predictions! Please click here to read Nostradamus visions as shown to Psychic John Le Sainte of the Upcoming New York City Earthquake, bridge collapse and train derailment. This Nostradamus prediction of the future New York City Earthquake is Fully explained and interpreted in great details. Nostradamus Predictions about the coming Nuclear attack by Terrorists as Revealed by the True Living Soul of Nostradamus to Psychic John Le Sainte. This dangerous Nuclear attack comes in the middle of the ocean and is described and explained in great detail by The Soul of Nostradamus to the world so that It may be Prevented! 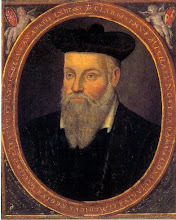 Nostradamus Predictions: the TRUE meaning of 666 and the Coming World War 3 three the Information and Technology War as revealed and shown to John Le Sainte by Nostradamus. The mark of the Beast 666 is already upon you as foretold millenia ago. Nostradamus has shown me, John Le Sainte the future to help you, your family and the entire world. To return to the Nostradamus Predictions Home Page.